Background: C.E.R.A., a continuous erythropoietin receptor activator, is in development to provide anemia correction and stable maintenance of hemoglobin (Hb) levels at extended administration intervals in patients with chronic kidney disease (CKD). This study examined its efficacy and safety when administered up to once monthly in patients who have CKD and are on dialysis and randomly convert directly from epoetin α or β one to three times weekly. Design, setting, participants, and measurements: In this three-arm, comparator-controlled, open-label, randomized, parallel-group, Phase III study, 572 dialysis patients (≥18 yr) who were receiving stable subcutaneous epoetin one to three times weekly were randomly assigned (1:1:1) to continue epoetin or to receive subcutaneous C.E.R.A. once monthly or twice monthly for 52 wk. Dosage was adjusted to maintain Hb ±1.0 g/dl of baseline level. Primary end point was mean change in Hb level between baseline and the evaluation period (weeks 29 to 36). Results: Mean Hb levels during the evaluation period were similar between groups (once-monthly C.E.R.A. 11.5 g/dl; twice-monthly C.E.R.A. 11.7 g/dl; epoetin 11.5 g/dl). The difference between C.E.R.A. and epoetin in mean change (97.5% confidence interval) in Hb concentration between baseline and evaluation was −0.022 g/dl (−0.262 to 0.217) for once monthly and 0.141 g/dl (−0.098 to 0.380) for twice monthly. Analysis demonstrated that C.E.R.A. was as effective as epoetin in maintaining Hb and was well tolerated. Conclusions: Subcutaneous C.E.R.A. once or twice monthly successfully maintained tight and stable Hb levels in patients who were on dialysis and randomly converted directly from epoetin one to three times weekly. Anemia is commonly associated with chronic kidney disease (CKD) (1–3) and contributes to the morbidity and mortality and reduced quality of life in these patients (4–10). Erythropoiesis-stimulating agents (ESA) and clinical practice guidelines have been beneficial in managing renal anemia (11–15), and anemia correction has been associated with improved patient outcomes (16,17). Current guidelines recommend maintenance of hemoglobin (Hb) levels at ≥11 g/dl (13,14,18). In addition, European and Australian guidelines specify an upper limit of 12.0 g/dl for patients with cardiovascular disease or diabetes (13,14), whereas US guidelines do not support routine maintenance of Hb >13 g/dl (18). Despite these guidelines, many patients still fail to achieve minimum Hb targets (17,19,20). For example, the Dialysis Outcomes and Practice Patterns Study demonstrated that more than one quarter of US patients on dialysis had an Hb level <11 g/dl, and the incidence was often higher (up to 77%) in other countries (17,20). Moreover, Hb levels fluctuate over short periods of time, such that many patients who have CKD and achieve Hb targets do not maintain their Hb level within target range for extended periods of time (21–24). It has been estimated that only 5% of patients who are on hemodialysis and have an Hb between 11 and 12 g/dl persistently remain within that range for 6 mo (22). Maintaining Hb levels within target ranges requires close monitoring of Hb and, with current agents, often requires frequent dosage adjustments (23). Hence, maintenance of stable Hb levels can be time-consuming and may burden renal units, which already have to cope with the growing incidence and prevalence of CKD (15,25,26). Consequently, we need agents that will provide predictable and stable Hb responses with minimal intervention from health care professionals. The use of current ESAs at extended administration intervals has been examined in several studies in patients who already had stable Hb levels at administration intervals of at least once weekly (27–31). However, only one study involved patients who were on dialysis (29), in which a stepwise introduction of longer intervals was required. Even so, a proportion of the enrolled patients did not maintain Hb levels. As a result, these studies do not provide strong evidence that such regimens can be applied to the spectrum of patients with CKD encountered in day-to-day clinical practice. C.E.R.A., a continuous erythropoietin receptor activator, is a novel agent that provides correction of anemia and stable control of Hb levels at extended administration intervals (32). Preclinical and Phase I and II studies demonstrate that C.E.R.A. has unique pharmacologic properties, acting differently than epoetin at the erythropoietin receptor level (33), with a long serum half-life (mean 134 h after intravenous and 139 h after subcutaneous administration in patients who are on peritoneal dialysis) and low clearance (32,34,35).These half-life values are considerably longer than those reported in healthy volunteers for epoetin α (6.8 h [intravenous] and 19.4 h [subcutaneous]) and epoetin β (8.8 h [intravenous] and 24.2 h [subcutaneous]) (36) and up to five times longer that those reported for darbepoetin α in patients who are on peritoneal dialysis (25.3 h [intravenous] and 48.8 h [subcutaneous]) (37). Phase II studies in patients who have CKD indicate that C.E.R.A. corrects anemia and maintains Hb levels within guideline targets when administered up to once monthly in patients who are on dialysis and in those not yet dialyzed (38–40). We report the results of PROTOS (Patients Receiving C.E.R.A. Once a month for the mainTenance Of Stable hemoglobin), a Phase III study of C.E.R.A. that was given subcutaneously at administration intervals of once monthly or twice monthly for the maintenance of Hb levels in patients who had CKD and were on dialysis and randomly converted directly from epoetin α or β. Patients were screened at 92 centers in 12 European countries, Brazil, Mexico, New Zealand, Panama, South Africa, Taiwan, Thailand, and the United States. Details of major inclusion and exclusion criteria are provided in Table 1. Patients were ≥18 yr of age, had chronic renal anemia, and were receiving hemodialysis or peritoneal dialysis for ≥12 wk before screening. They were required to have received treatment with subcutaneous epoetin one to three times weekly with the same administration interval for ≥8 wk before screening and to have a stable Hb concentration within the range 10.5 to 13.0 g/dl during the baseline period. The study was conducted in accordance with the Declaration of Helsinki, International Conference on Harmonization Good Clinical Practice guidelines, and local ethics committees. All study participants provided written informed consent. PROTOS was a three-arm, controlled, open-label, randomized, multicenter, parallel-group, Phase III study designed to compare the efficacy and tolerability of two dosing intervals of subcutaneous C.E.R.A. with that of continued epoetin therapy for the maintenance treatment of anemia in patients who had CKD and were receiving dialysis and had previously been maintained on subcutaneous epoetin α and β (one to three times a week). After a 4-wk baseline period, when patients continued to receive epoetin, those who were eligible were randomly assigned (1:1:1) to receive subcutaneous C.E.R.A. once a month, to receive subcutaneous C.E.R.A. twice a month, or to continue receiving subcutaneous epoetin at their current dosage and administration interval (Figure 1). Patients were randomly assigned to study treatment via a central randomization center with stratification by geographic region. Study design. C.E.R.A. Q2W, twice-monthly continuous erythropoietin receptor activator; C.E.R.A. Q4W, once-monthly continuous erythropoietin receptor activator; epoetin QW to TIW, epoetin one to three times weekly; R, randomization. Starting dosages of C.E.R.A. were based on the epoetin dosage received during the week preceding randomization (Table 2). The study consisted of a dosage titration period during the first 28 wk after the initial dose of study drug (weeks 1 to 28), followed by an 8-wk efficacy evaluation period (weeks 29 to 36) and a 16-wk long-term safety follow-up (weeks 37 to 52; Figure 1). In the titration and evaluation periods, the dosage of C.E.R.A. was adjusted to maintain patients’ Hb within a range of ±1.0 g/dl of their baseline Hb and between 10.0 and 13.5 g/dl. During the long-term safety observation period, the dosage of C.E.R.A. was adjusted to maintain Hb levels within a range of 11 to 13 g/dl. Dosage adjustments were permitted for safety at any point during the study. Unless safety concerns dictated otherwise, dosage adjustments for C.E.R.A. were performed at the next scheduled dosing day so that the administration interval remained unchanged throughout the study; however, dosage adjustments were not to be performed more often than once every 4 wk. Dosage adjustments for C.E.R.A. were performed according to a predefined protocol, with the need for adjustment based on consistency of two consecutive Hb assessments. During titration and evaluation, C.E.R.A. dosages were decreased by 25% for Hb increases >1 g/dl versus baseline or for Hb >13.5 and ≤14 g/dl, and increased by 25% for Hb decreases >1 g/dl versus baseline or for Hb ≥9 and <10 g/dl. C.E.R.A. dosage decreases of 50% were made for Hb increases >2 g/dl versus baseline and increases of 50% for Hb decreases >2 g/dl versus baseline or Hb <9 g/dl. During the long-term safety period, C.E.R.A. dosage was increased or decreased by 25% for Hb ≥9 and <11 g/dl and Hb >13 and ≤14 g/dl, respectively, and increased by 50% for Hb <9 g/dl. Treatment was temporarily interrupted if Hb exceeded 14 g/dl. Dosage adjustments for epoetin α and β were performed according to their respective labeling. For example, dosage increases for epoetin α were not performed more frequently than once a month, unless clinically indicated, and dosages for epoetin β could be adjusted at intervals of 1 to 2 wk individually for the patient. For all treatment groups, Hb <9 or >14 g/dl and Hb changes >2 g/dl versus baseline were to be avoided for safety reasons. Iron supplementation was performed according to individual center practice and adjusted to maintain adequate iron status: serum ferritin ≥100 ng/ml and transferrin saturation ≥20% (or hypochromic red blood cells [RBC] <10%). C.E.R.A. (F. Hoffmann-La Roche Ltd., Basel, Switzerland) was supplied as a solution in vials that contained 1 ml of 50, 100, 200, 400, or 1000 μg/ml. Epoetin β was supplied in multidose vials by F. Hoffmann-La Roche Ltd. for participating study centers located outside the United States. Epoetin α was obtained from commercial sources by participating sites located in the United States. Patients were assessed weekly during the screening/baseline, titration, and evaluation periods and once every 2 wk during the long-term safety observation period. Hb, BP, and heart rate were measured at each visit. Iron and other laboratory parameters were measured at screening/baseline, then every 8 wk from week 5 (iron parameters were assessed every 4 wk during the evaluation period), and at the final visit. Physical examination and electrocardiograms were performed at screening/baseline, at weeks 29 and 37 (electrocardiogram only), and at the final visit. Immunogenicity testing to the study medications was carried out at weeks 1, 13, 29, and 41 and at the final visit using ELISA performed by a central laboratory. The primary efficacy analysis compared, separately, the mean change in Hb level between the baseline and evaluation period for patients who received C.E.R.A. once monthly or twice monthly with that for epoetin. 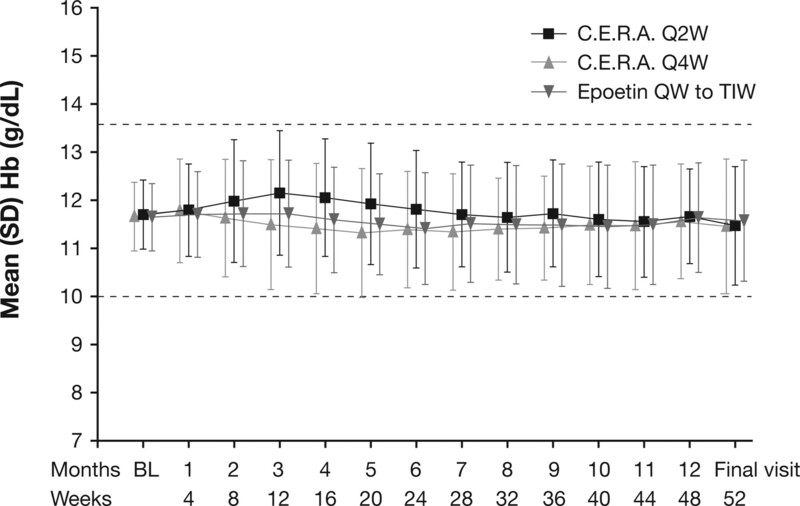 For demonstration of noninferiority, the lower limit of the two-sided 97.5% adjusted confidence interval (CI) for the difference between epoetin and C.E.R.A. in mean change in Hb level had to be above −0.75 g/dl. The 97.5% CI was calculated with adjustment for covariates that might influence Hb response (baseline Hb and geographic region). A sample size of 465 patients (155 patients per treatment arm) was determined to provide 90% power to show that C.E.R.A. administered at a lower frequency is as effective as epoetin. The primary end point analysis was conducted in the per-protocol (PP) population because this approach to noninferiority analysis is more stringent than using the intent-to-treat (ITT) population. Patients were excluded from the PP population on the basis of the following criteria: fewer that five Hb measurements during evaluation, missing doses of study medication in weeks 26 to 35, nonstable baseline Hb, inadequate iron status at baseline or evaluation, RBC transfusion at baseline or blood loss within weeks 21 to 33, hemoglobinopathies, or hemolysis. Secondary end points consisted of the number of patients who maintained average Hb concentration within ±1.0 g/dl of their average baseline Hb concentration during the evaluation period and the incidence of RBC transfusions during the titration and evaluation periods. Confirmatory analysis of the primary end point was performed on the ITT population (all patients who were randomly assigned to treatment). Secondary end points were compared among treatment groups in the ITT population using descriptive methods. The ITT population comprised 572 patients from 89 centers in 20 countries; 70% from Europe (e.g., France 14.0%, Hungary 13.6%, and Poland 9.3%) and 11.9% from the United States. The study began in March 2004 and was completed in September 2005. Patient disposition is shown in Figure 2. In total, 499 patients completed the evaluation phase and 461 patients completed the safety follow-up phase of the study. 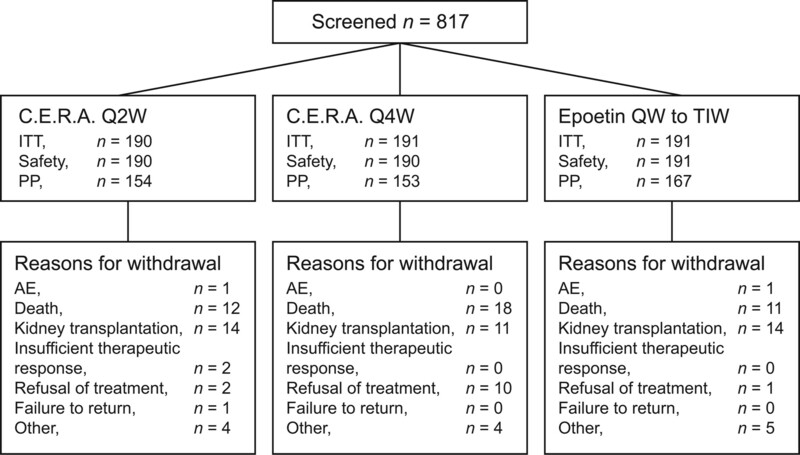 Reasons for premature withdrawal of 111 patients were death (n = 41), kidney transplantation (n = 39), refusal of treatment (n = 13), adverse events (AE; n = 2), insufficient therapeutic response (n = 2), failure to return (n = 1), and other (n = 13). One patient in the once-monthly C.E.R.A. group did not receive study medication and was excluded from the safety population (n = 571). Summary of study populations and patient disposition. AE, adverse event; ITT, intent-to-treat; PP, per-protocol. A total of 98 patients in the ITT population did not fulfill the criteria for inclusion in the PP population (38, 36, and 24 for the once-monthly C.E.R.A., twice-monthly C.E.R.A., and epoetin groups, respectively). The most common reasons for exclusion were fewer than five Hb values or no valid Hb value during the evaluation period (25, 27, and 16 patients, respectively) and/or inadequate iron status during the evaluation period or no valid value (22, 29, and 15 patients, respectively). Demographic and baseline characteristics were similar between treatment groups for the ITT population (Table 3) and for the PP population and were generally representative of the population from which they were derived. The primary causes of CKD across all treatment groups were hypertension/large vessel disease (28%), diabetes (25%), and glomerulonephritis (21%). Comorbidities were common in the patients who participated in the study (Table 4). Diabetes and history of ischemic heart disease were each present in approximately one third of patients. A total of 89% of patients in both C.E.R.A. groups and 87% in the epoetin group reported at least one other pre-existing condition in addition to the predefined risk factors. Before randomization, >50% of patients in each group received epoetin at intervals of two or three times per week; approximately 95% received ≤16,000 IU/wk epoetin. Mean Hb levels at baseline were similar between treatment groups (Table 3). A similar percentage of patients were receiving supplementary iron at baseline in each treatment group (once-monthly C.E.R.A. 84%; twice-monthly C.E.R.A. 82%; epoetin 81%). Mean Hb levels during the baseline, evaluation, and follow-up periods were similar in the three study groups (Table 5, Figure 3). For the primary efficacy analysis (PP population), after adjustment for covariates, the mean change in Hb from baseline to the evaluation period was −0.131 g/dl for once-monthly C.E.R.A., 0.032 g/dl for twice-monthly C.E.R.A., and −0.109 g/dl for epoetin. The difference in the mean change (97.5% CI) in Hb between the C.E.R.A. groups and the epoetin group was −0.022 g/dl (−0.262 to 0.217) for once-monthly C.E.R.A. and 0.141 g/dl (−0.098 to 0.380) for twice-monthly C.E.R.A. The lower limit of the 97.5% CI was therefore well above the prespecified margin of −0.75 g/dl in both groups, demonstrating that once-monthly or twice-monthly C.E.R.A. (both P < 0.0001; Figure 4) is as effective as epoetin in maintaining anemia control among these patients who randomly converted directly from epoetin (one to three times a week). Similar data were obtained for the ITT population (Figure 4). Mean monthly hemoglobin (Hb) values (ITT population). 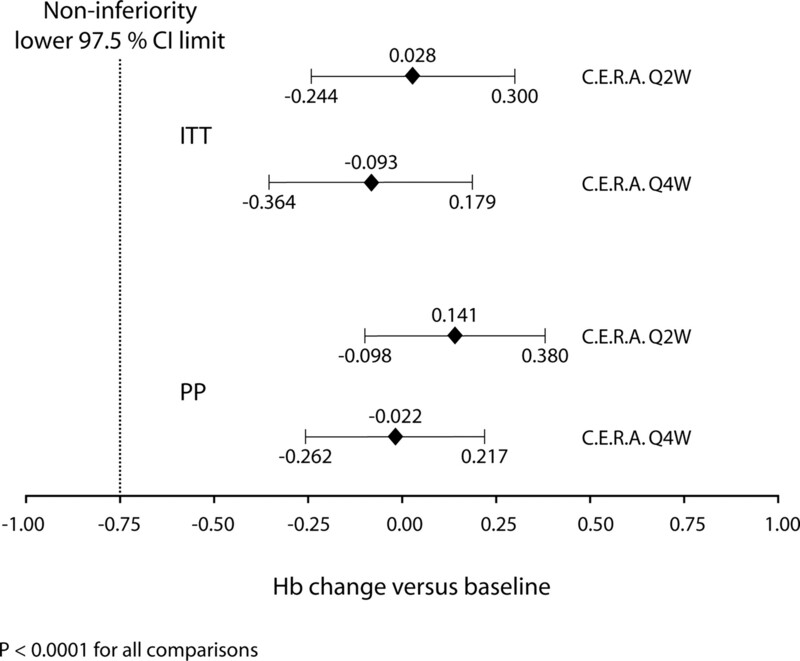 Noninferiority test for difference in mean change in Hb level from baseline for C.E.R.A. versus epoetin. CI, confidence interval. For the secondary analyses, the proportions of patients with mean Hb within ±1.0 g/dl of baseline values during the evaluation period were 66.1, 75.6, and 72.2% in the once-monthly C.E.R.A., twice-monthly C.E.R.A., and epoetin groups, respectively (ITT population). The proportion of patients who maintained stable Hb within the range 10.0 to 13.5 g/dl during the evaluation period was similarly high in all groups (88.1% for once-monthly C.E.R.A., 91.5% for twice-monthly C.E.R.A., and 88.1% for epoetin), with only a very small proportion with Hb >13.5 g/dl (1.8% for once-monthly C.E.R.A., 1.2% for twice-monthly C.E.R.A., and 2.8% for epoetin). In a post hoc analysis of intrapatient Hb variability, the mean within-patient SD for Hb during the titration period (ITT population) in the once-monthly C.E.R.A., twice-monthly C.E.R.A., and epoetin groups was 0.85, 0.84, and 0.78 g/dl, respectively (NS for each C.E.R.A. group versus the epoetin group). Within-patient SD for Hb during the evaluation period were also similar across treatment groups (ITT population): 0.57, 0.52, and 0.57 g/dl for once-monthly C.E.R.A., twice-monthly C.E.R.A., and epoetin, respectively (NS for each C.E.R.A. group versus the epoetin group). The percentage of patients who required RBC transfusion was low in the once-monthly C.E.R.A. and twice-monthly C.E.R.A. groups (10.5 and 6.3%, respectively) and the epoetin group (9.9%; safety population), confirming the safety of direct conversion of patients who were stable on epoetin. An exploration of dosages of trial medication in the safety population revealed that baseline median dosages were 120 μg/4 wk (interquartile range [IQR] 120 to 200) and 60 μg/2 wk (IQR 60 to 100) for C.E.R.A. and 6000 IU/wk (IQR 4000 to 10,000) for epoetin. During the evaluation period, the median dosages of C.E.R.A. were 150 μg/4 wk (IQR 91 to 250) and 56 μg/2 wk (IQR 27 to 84), and these remained the same during the rest of the study. The median dosage of epoetin was 5500 IU/wk (IQR 3000 to 9000) during the evaluation period and 6000 IU/wk (IQR 3000 to 10,000) during the remainder of the study. The median (IQR) number of dosage changes per patient throughout the entire study period was 6 (3 to 9) for twice-monthly C.E.R.A., 4 (2 to 7) for once-monthly C.E.R.A., and 5 (3 to 8) for epoetin; these occurred most frequently during the titration and long-term follow-up periods. For the epoetin group, this did not include dosage changes that were the result of differences in the split of doses from 1 wk to another, provided that the total weekly dosage remained the same. The incidences of AEs and serious AEs are given in Table 6. In total, 90% of patients across all treatment groups experienced at least one AE. The most commonly reported AEs were hypertension, procedural hypotension (induced by dialysis), nasopharyngitis, headache, and diarrhea (Table 6). Most events were mild or moderate in intensity and distributed evenly across the three treatment groups. The incidence of treatment-related AEs was low in all groups (once-monthly C.E.R.A. 6%; twice-monthly C.E.R.A. 4%; epoetin 2%). Four patients experienced serious treatment-related AEs. Three patients in the once-monthly C.E.R.A. group experienced convulsion, arteriovenous fistula thrombosis, and gastrointestinal necrosis and sepsis (fatal outcome), and one patient in the epoetin group received a diagnosis of pure red cell aplasia and was withdrawn from treatment. Anti-erythropoietin or anti-C.E.R.A. antibodies were not detected in any patient in the C.E.R.A. groups. Two patients discontinued prematurely as a result of serious AE not related to study treatment: hypertension in the twice-monthly C.E.R.A. group and hemorrhagic gastritis in the epoetin group. The most common causes of the 43 deaths during the study were cardiac disorders (n = 23), followed by infections and infestations (septic shock n = 3; various forms of sepsis n = 3; bronchopneumonia n = 1). Only one death was considered related to study treatment (once-monthly C.E.R.A. : gastrointestinal necrosis followed by sepsis). There were no clinically relevant changes in vital signs or iron or laboratory parameters during the study. Dialysis adequacy was similar across the three groups and was maintained during the study. PROTOS is the first large-scale study to demonstrate direct random conversion of patients who have CKD and are on dialysis to subcutaneous once- or twice-monthly C.E.R.A. Mean Hb levels during the evaluation period for patients who received C.E.R.A. were within current guideline ranges (11.46 and 11.70 g/dl, respectively), and the difference in Hb level between baseline and evaluation was within ±0.15 (0.032 and −0.131) in both C.E.R.A. groups. Hence, the results of this study show that switching directly from administration of epoetin α or β one to three times weekly to C.E.R.A. at extended dosing intervals is effective for maintaining tight, sustained, and predictable control of Hb levels within target range in this patient population. Moreover, mean Hb values remained stable during the evaluation and long-term safety periods, demonstrating maintenance of Hb control over time. In addition, C.E.R.A. was generally well tolerated. Most AEs that were reported during the study were consistent with the morbidity that is associated with advanced CKD and not considered related to study medication. PROTOS thus confirms findings from Phase II studies that the unique pharmacologic properties of C.E.R.A. enable it to provide sustained maintenance of target Hb levels when administered up to once monthly (38–40). Furthermore, data from this study are consistent with the results of a similarly designed Phase III study in which intravenous C.E.R.A. effectively maintained Hb levels in patients who had CKD and were on dialysis and converted directly from epoetin one to three times weekly to once- or twice-monthly C.E.R.A. (41). One previous, single-arm study examined the efficacy of once-monthly ESA administration in patients who had CKD and were on dialysis (29); the administration interval was sequentially extended contingent on patient response. In contrast, our study required patients to convert directly to receive C.E.R.A. only at the administration interval to which they were randomly assigned. The demographic and baseline characteristics of patients were consistent with the general dialysis population and demonstrated a high prevalence of comorbid diseases. Hence, the study population was largely representative of patients who are on dialysis and treated for renal anemia in clinical practice. The growing number of patients with CKD and the burden of managing this disease and its complications (15,42,43) highlight the expected benefits of C.E.R.A. We propose that the ability of C.E.R.A. to maintain tight Hb levels with once-monthly administration should improve anemia management in CKD by alleviating the increasing workload of health care professionals. Once-monthly administration will save up to 144 injections per patient per year compared with three times weekly dosing. PROTOS is the first randomized, controlled study of direct conversion of patients who have CKD and are on dialysis from a stable regimen of epoetin up to three times weekly to once-monthly subcutaneous C.E.R.A. This study confirms the efficacy and the safety of once-monthly subcutaneous C.E.R.A. for maintaining tight control of Hb levels within recommended ranges in patients who are converted directly from epoetin administered one to three times weekly. The use of subcutaneous C.E.R.A. once monthly to achieve tight, sustained control of Hb may provide an opportunity to improve overall disease management for all patients with CKD without adding to the work burden of CKD on health care resources. Professor Locatelli has received honoraria from and has acted as a scientific advisor for F. Hoffmann-La Roche, Dompé, Shire, and Amgen. Professor Ryckelynck and Dr Harris have received honoraria from and have acted as scientific advisors for F. Hoffmann-La Roche. No financial conflict of interest exists for Professor Sulowicz, Professor Balla, or Dr Csiky. Drs Ehrhard and Beyer are full-time employees of F. Hoffmann-La Roche, as indicated on the title page with the authors’ affiliations. The PROTOS study was sponsored by F. Hoffmann-La Roche Ltd. (Basel, Switzerland). Data from this study were previously published in abstract form ([Abstract SP424]. Nephrol Dial Transplant 21[Suppl 4]: iv156–iv157, 2006). PROTOS Study Investigators: H.J. Adrogue, F.W. Albert, A. Albertazzi, J.-C. Aldigier, M. Amato, H.-G. Asmus, A. Bajo Rubio, J. Balla, P. Barany, E. Barranco, G. Barril, P. Bataille, F. Berthoux, K. Bidas, T. Bochicchio, C. Breen, W. Buranachokpaisan, J. Burkart, P.-L. Caraman, N. Coplon, R. Correa-Rotter, M. Couttenye, B. Csiky, S. Dawood, A. Debure, H. Deodhar, H. Dieperink, S.A. Draibe, R. D'Souza, M. Feriani, J. Fort, L.E. Garrett, Jr., J. Gasco Company, M. Germain, C. Granolleras, K. Harris, I. Henderson, J.C. Kallmeyer, J. Kaufman, H. Keuleers, M. Klinger, P. Koskinen, E. Ladányi, N. Lameire, E. Le Guen, K. Lempert, F. Locatelli, K. Lynn, I.C. Macdougall, I. MacPhee, F. Malberti, P. Marchini, A.P. Maxwell, R. McCrary, F. Metivier, K. Metsarinne, I.P. Naicker, E.D. Neto, P. Nolen, S. Opatrna, J.-P. Ortiz, P. Peeters, J. Penfield, J. Pengloan, R. Perez, W. Phumratanaprapin, G. Pidgeon, L. Piera, J. Portoles, W.Y. Qunibi, M.C. Riella, C. Rikker, B. Rutkowski, J.-P. Ryckelynck, H. Saha, D. Sanchez-Guisande, R. Schmidt, R. Selgas, K.-H. Shu, D. Sobotova, T. Stompor, W. Sulowicz, V. Sumethkul, C. Sun, P. Thanakitcharu, P. Thon, K. Tungsanga, I. Valkovsky, D. Verbeelen, Z. Vezekenyi, L.G. Weiss, P. Williams, K.-D. Wu. Medical writing support was provided by Margaret Duggan-Keen, Melanie Jones, and Christine Gardner at Prime Medica Ltd. during the preparation of this article, supported by F. Hoffmann-La Roche Ltd.
Responsibility for opinions, conclusions, and interpretation of data lies with the authors.